FANCIBUL FRENCH BULLDOGS were bred by husband Bob and I in Tecumseh, OK from 1994 through 2011. After Bob's passing, The Fancibuls and I, now Karen Fore-Monroe, have relocated in my birthplace near Oklahoma City. OUR HISTORY: My first-time introduction to the French bull dog breed was in 1992. This was a rare breed at that time. I watched a little impish creature running in a backyard coursing in circle 8's who stopped to bow at my feet with the famous "playbow". I learned later that this is a typical Frenchie characteristic. This adorable little creature home went home with me. Her life was short. However, that brief encounter with a French bulldog led to a personal L'Affair du Coeur with the breed of French bulldogs. By 1994, I had become a hobbyist learning to train and show my Fancibuls. The first Fancibul litter was born in November 1994. My keeper, Ch Here Tis' Up 'n Adam's Match, won a 5 pt. major at 6 months 1 week of age over championed bullies with my very awkward attempt at handling him in AKC conformation competition. I was "hooked" by the excitement of showing and caring for Frenchie puppies, attending AKC dogshows, and researching the breed's beginning, perusing pedigrees, and the challenge of giving loving and special care which a French bulldog requires to be healthy and happy, and the complexities of genetics and planned breedings that are successful. FAST FORWARDING TO 2016, Fancibuls have evolved into a bloodline that has champions in many countries of the world and also a family of dogs that has increased one-third in longevity since the first litter of 1994 when parents and grandparents of my first 4 Frenchies lived to be 9 l/2 to 10 1/2 years of age. Prior to 1992, I had owned cocker spaniels as a housepet, the rare breed of Anatolian shepherds, a Komondor for guarding property, and an English bulldog. No other pet companion has captured my heart like this breed who is often referred to as the dog in the cloak of a clown with a heart of a philosopher. THE SECRET IS OUT! "Back in the day" in Oklahoma, when this breed was rare, I was so smitten with the uniqueness of their behavior, loving devotion as a household pet, and ease of grooming. Thereafter, the breed rose in 2015 to No. 6 of most popular purebred dogs registered with The American Kennel Club. Although we have several French Bulldog puppies for sale each year and an occasional "retiree" from our breeding program, I will be the first to admit that a French bulldog is NOT the breed for every fancier of purebred dogs nor ideal pet for every home. If deciding whether a French Bulldog is the right pet for your family, take time to read "Am I The One?" FANCIBUL FOCUS: Dedicated to breeding healthy, lapsize French bulldogs that meet the AKC standard for physical conformation and temperament. Placing extra puppies into long-term loving homes. Allowing the Best of the Best to contribute to the future of the Breed. COMPETITIVE RECORD: FANCIBUL is a "show kennel" which has evolved with a 23-year history of producing healthy, high quality French Bulldogs that successfully compete in the American Kennel Club conformation competitions, obedience, and/or rallies. FANCIBULS are represented by champions in many other countries of the world. Since not all are destined for show business in the Sport of Dogs, I often have puppies for sale to others as pet/companions. Watch the AvailABul page for announcements. By an email request, you may receive newsletters that update plans for upcoming litters. Write fancibul@aol.com. Since our first homebred litter in 1994, 69 FANCIBUL FRENCH BULLDOGS have achieved AKC titles in conformation competition, and 10 Fancibuls have top show awards in conformation competitions in France, Canada, Argentina, Brazil, Thailand, Taiwan. and Russia and Eastern European competitions. Several have had success in obedience, rallies, or agility competitions. Some Fancibuls have become therapy dogs to patients in children and adult facilities. A few FANCIBULS became the foundation for top breeders in other countries. Most were trained and handled by their proud owners. Our latest AKC champs are CH FANCIBULS FINISHING TOUCH, CH FANCIBUL GRANDE BOULE DE FEU, GR CH FANCIBULS BFF BARRY. For those now showing, look at the Show Biz page. GREATEST JOY: Besides providing others with the joy of owning a FANCIBUL FRENCH BULLDOG puppy, I have added one other facet to my original goal: After 26 years of owning a Frenchie and 23 years in the Sport of Dogs developing a breeding program, I now derive gratification from helping the next generation of fanciers enjoy this hobby as they develop their own breeding programs. I hope to leave a legacy to this breed that has given so much to my life over the years. It's gratifying to learn of the daily life as FANCIBULS are enjoying life with others around the world. I sense that I am a part of their joy of living through our bloodline . SERVICE TO THE BREED. I have been a member of the French Bull Dog Club of America since 1996. This national breed club has the distinction of being the first among AKC-sanctioned national breed clubs. 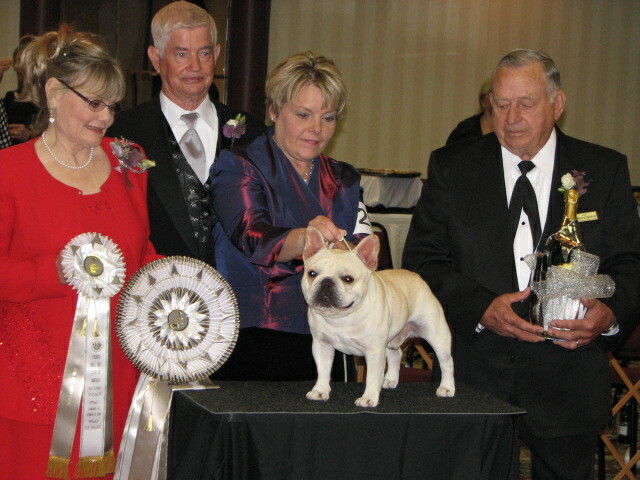 I have given time to serve as Breeder Referral person; Chair Person for the Breeder's Education Committee; an associate member of the Dallas/Fort Worth French Bulldog Club (a regional club for fanciers); I received Breeder of Distinction Award from the French Bull Dog Club of America; in 2010; and am an AKC BREEDER OF MERIT. I am in compliance with the Code of Ethics of the French Bull Dog Club of America. 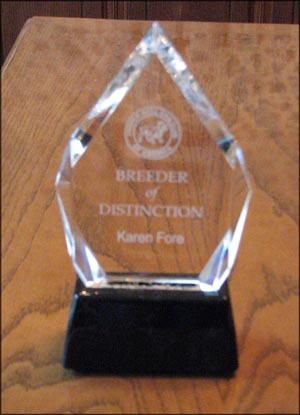 Please check www.FBDCA.org for information about the breed, ethical breeders, and policies. of the FBDCA Natl. Specialty 2008.